The Pull Dog Ball Mount ( Hitch ) is the next step forward in the evolution of towing hitches. 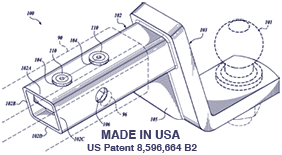 Pull Dog is patented because it uses a locking wedge design never seen before in tow hitches. Pull Dog is made in the US and is made entirely of high quality materials. Pull Dog is made to last. How Does The Pull Dog Hitch Work? When installed the Pull Dog Hitch locks down inside your receiver. It does this by pressing two pistons through openings in the top of the ball mount shank that press against the inside top of the receiver. When tight the Pull Dog hitch eliminates all the noise coming from your hitch when going over bumpy or uneven roads. Pull Dog is totally effective and results in a smoother, quieter ride in your tow vehicle. Pull Dog also helps surge brakes work more smoothly and may even help horses stay more calm during hauling.